The Beaufort National Cemetery is a somber but historically important site located in the heart of Beaufort County. Quietly beautiful, with the region's renowned live oaks towering over the lines of small, white headstones, the cemetery holds a world of historical significance, and is an important stop for history and Civil War buffs touring the coastal South Carolina region. The cemetery is actually one of six national cemeteries that were established in 1863 for the burial of Union troops and sailors who died in the region during the Civil War. Located in between the major cities of Savannah, Georgia and Charleston, Beaufort was an easy target for the Union Army, and in 1861, a Union fleet of 71 ships, eager to create a blockade along the southern coastline, attacked the area's two forts along the mouth of the Beaufort River, and within a day had taken control of the region. In 1863, the Union Army commissioned the construction of a national cemetery in Beaufort, and decided to move the remains of Union soldiers who had fought and died all across the southern states to this new, honored site. With this centuries-long history of Civil War burials - burials that occurred well after the war had ended - the site was listed on the National Register of Historic Places in 1997, and remains a quietly distinguished local attraction today. The 33 acre site has more than 18,500 interments, including the Civil War veterans, and a few regional notable figures including Colonel Donald Conroy, better known as The Great Santini, and Master Sergeant Joseph Simmons, a Légion d'honneur recipient, as well as a World War I and World War II veteran. 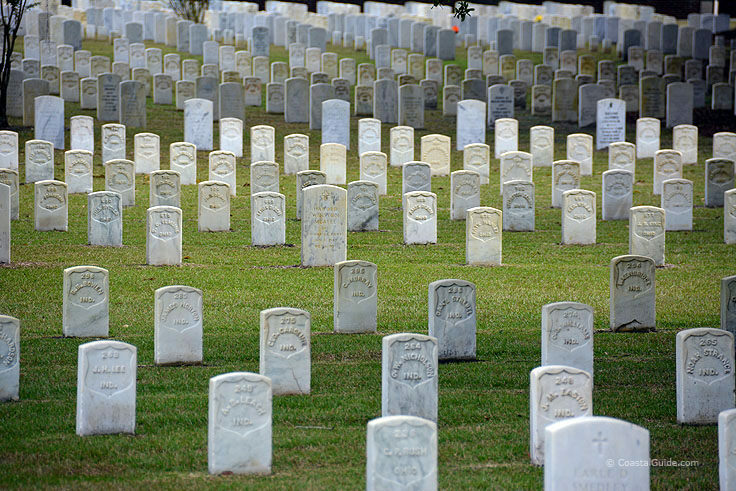 In fact, the Beaufort National Cemetery has interments from every major American conflict, beginning with the Spanish American War and ending with the most recent Gulf War. On the surface, this is a bit of a grisly landmark and a surprising visitor destination, but the quietly beautiful cemetery, which was sketched out and designed in the midst of the Civil War, is an attraction in itself.The semi-circle property is bordered by a historic brick wall that was constructed in 1876, and features an ornate original entrance that is guarded by large limestone piers that were added in 1940. A 20' tall granite obelisk stands at the main gate honoring the Union troops who died during the war - a structure that was constructed in 1870 by unsung war hero Eliza McGuffin Potter, who cared for Union soldiers at the nearby Beaufort hospital. Potter was also the driving force between another one of the cemetery's notable landmarks, a marble and brick box tomb with the inscription of 175 soldiers from 18 states, which was also added to the cemetery in 1870. The cemetery is open for visitors daily from 8:00 a.m. until sunset, and the cemetery office is open Monday through Friday from 8:00 a.m. until 4:30 p.m., and is closed on major federal holidays with the exception of Memorial Day and Veterans Day. 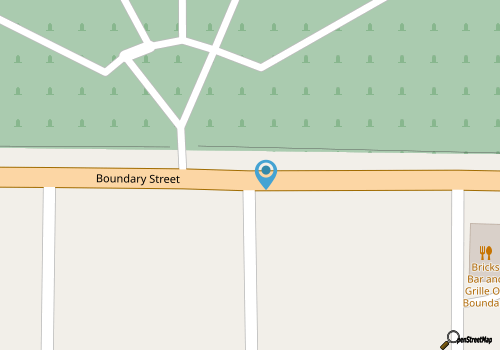 The cemetery is located in the heart of Downtown Beaufort, along US Highway 21, also known as Boundary Street. 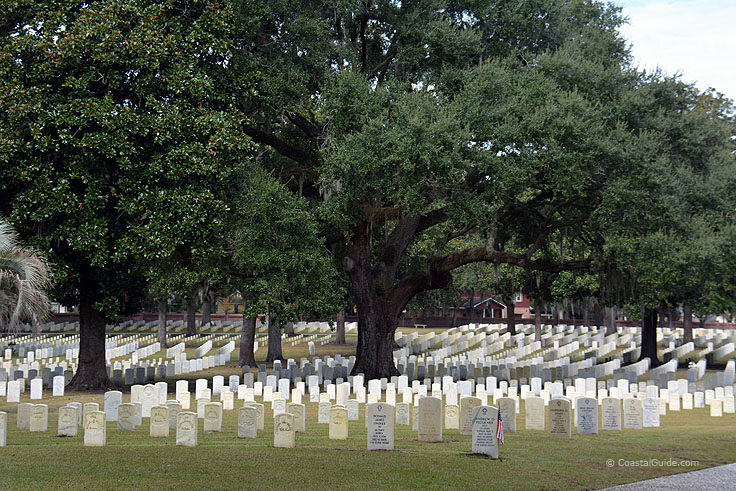 Visitors are asked to remain respectful at all times while on site, and additional information about the cemetery itself and the interred can be found online at http://www.cem.va.gov/cems/nchp/beaufort.asp. 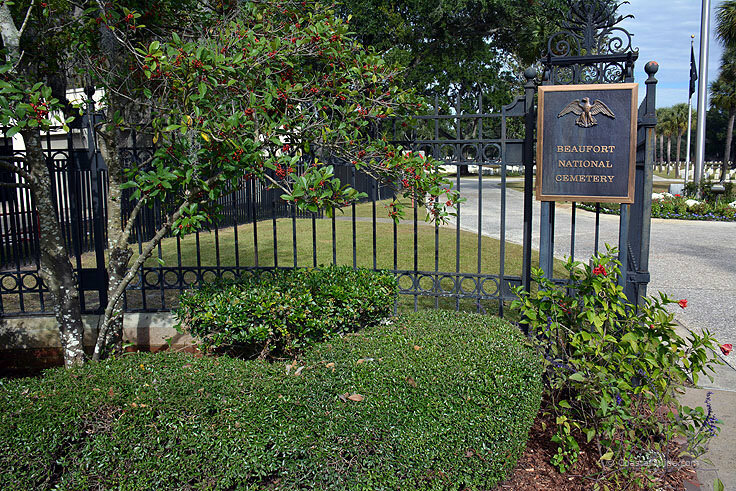 A subdued historical site that is nonetheless serene and picturesque, the Beaufort National Cemetery is an important landmark for proud military families and their loved ones throughout the centuries. With a far-reaching and notable link to Beaufort's past, especially the Civil War era, the site is worthy of visitation by history buffs, visitors with an interest in the War Between the States, and anyone with an inherent sense of American pride.